Chicago Cooley Vocational H.S. "Comets"
Photo taken by Sylvester Island, Jr.
Chicago (population: 2.8 million) is located along the shores of Lake Michigan in far northeastern Illinois. From its early days as a Potawatomie settlement, then as the site of Fort Dearborn in 1803, which led up to the formation of the city and its incorporation in 1833 and 1837, respectively, the "City of Big Shoulders" became a major location in the US for various reasons. Railroads and water transportation were two reasons why Chicago was one of the fastest growing cities in the country during the 19th Century. The web site located at http://www.rapdict.org/Cabrini-Green gives a nice history of the Cabrini-Green housing project. The area is located on Chicago's near north side bordered by the streets of Evergreen Avenue, Sedgwick Street, Chicago Avenue, and Larrabee Street. The official address was 1225 N. Sedgwick Street. The Cabrini-Green housing area was built in the late 1950s through the early 1960s. The area is one of the more famous small neighborhoods in Chicago. It was given national attention in 1982 when then Chicago Mayor Jane Byrne lived in one of the apartments there to "prove" it was safe to do so. In the beginning, Cabrini-Green's population reached about 15,000 residents. In order to provide educational opportunities for the students there Cooley High School was developed. Jan Prymus tells us the following about the history of the Colley High School building. "The school building was constructed in 1912 for Lane Technical High School. 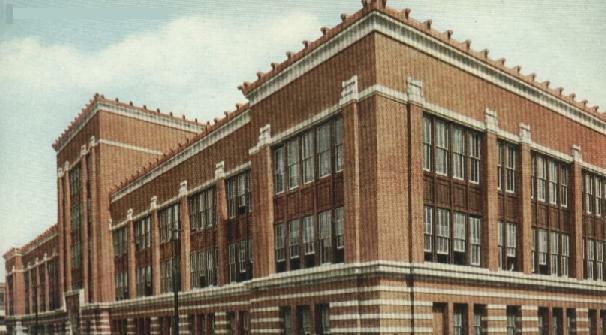 When Lane Tech moved in 1934 to their new location at Western and Addison, their former building became Washburne Trade School, who moved to 14th and Union. In September of 1958 when Washburne Trade School moved to the new location on 31st Street, the former Washburne Vocational High School was renamed Edwin G. Cooley High School." 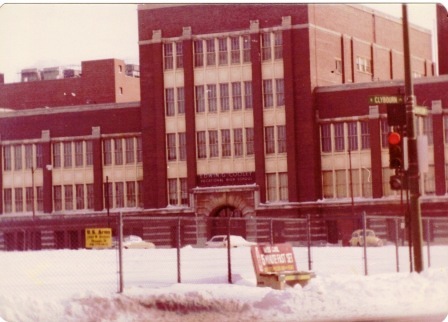 Submitted by Sylvester Island, Jr.
Cooley High School's first year was in the 1958-59 school year with the first graduating class being the class of 1959. Cooley High was closed in 1979 due to the age of the building. The school was replaced by Near North High School. Cooley High School was the subject of a popular film from 1975 appropriately titled "Cooley High". We are searching for any further information, and a more accurate history, regarding Cooley High School. The photo above is the Cooley High building from when it was known as Lane Technical High School (c. 1930s). A more recent photo of the high school building is also welcome. Cooley HS team nickname: the "Comets"
It is probable that inter-scholastic sports were offered at Cooley High School. It is probable the boys competed in baseball, basketball, and track, probably many other sports as well. The girls may well have competed in volleyball, basketball, and track and many other sports too. If you have ANY information you can share regarding Cooley High School please contact us via the means listed below. "I was a teacher at Cooley High from 1968 until it closed in June of 1979. I believe that the school was closed simply because the building was old, inefficient, too big with a large portion of the building unused. There was also an upper grade center housed in the facility which closed several years before the high school closed. Prior to 1960, the building housed the Washburn Trade School. Prior to 1934? it was Lane Tech High. From 1968 to 1976 the only inter-scholastic sport offered was boys basketball, frosh-soph and varsity. The coaches were Michael Levy and Jimmy Johnson respectively. I believe Mr. Levy is still working for the Board of Education. Mr. Johnson is deceased. In 1976, I believe, inter-scholastic baseball was initiated. Mr. Levy was the coach. I don't recall any inter-scholastic sports for the girls. The girls gym teacher was Penny Padley. She is retired." "I happened upon your Cooley website; greatly enjoyed reading about my alma mater! I attended Cooley from 1960-64, and graduated in June, 1964. The school building was constructed in 1912 for Lane Technical High School; when they moved in 1934 to their new location at Western and Addison, their former building became Washburne Trade School, who moved to 14th and Union. 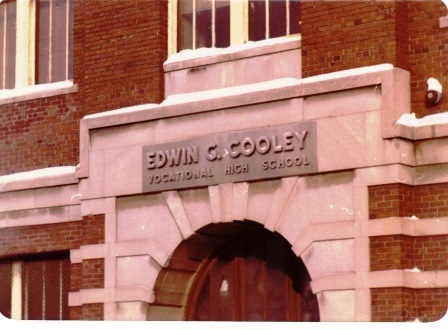 In September of 1958 when Washburne Trade School moved to the new location on 31st Street, the former Washburne Vocational High School was renamed Edwin G. Cooley High School. Joseph J. Partle was the principal. There were actually three seperate schools; the trade school, the continuation school, and the vocational high school - all under one roof. I still have the student handbook, 45 pages of information, including school songs, floor plans, teacher names, and much more. My electric shop, in which I majored, was in room 222, facing Division and Orleans, also the electric teacher was Raymond T. Bernke. Now retired, I still look back fondly on my Cooley days - I would enjoy sharing informaiton with you and others interested. Is there an organized group of former Cooley students/teachers? Are reunions held?" "I attended Cooley High for three years and have some very fond memories, especially of the print and machine shop. At the time I went the "EL" ran directly in back of the school and the Oscar Myair wienner factory. I also rememeber the basketball team." the only sport was Basketball. I played on the 1966 freshman - sophomore team under Michael Levy. Mr. Johnson was head of Athletics . The last reunion was some years ago with all years attending. They tried about three years but failed lack of response .Those were good days. I took electric shop also. Graduated class of 1969." "My Dad, Francis Miller, taught @ Cooley from 1962 to 1968, as a drafting instructor. We still have a gavel that was made for him by his students as he used to use a 2x4 to the desk to call class to order. My Dad often looked back with fondness for Cooley. He had returned to college to obtain his degree in after a back injury that ended his career in masonry. Our family would meet him @ Cooley once a month in the evening as he taught adult education classes in the evening after working a full day. We would have dinner the the Oscar Meyer Cafeteria, which was a treat in the 1960's. I also remember the fashion shows that were held by the fashion technology & cosmetology programs--they were awesome! He went on to help develop the Building Technology Program @ Thornton Community College, Harvey, IL now South Suburban College, South Holland, passed away 3/2000." "I am a big fan of Cooley High. The movie and the school. I didn't go there but a family friend did. His name was Larry Beusell. Unfortunately, he was killed in Detroit back in the mid 90's. I just read your wonderful article on Cooley High and I read that you were interested in receiving some resent pictures of the school and wondered if you were still interested. I don't know about "recent," but, I have two pictures that I took myself, back in 1977 (photos posted at top of page)!! I thought I had more time to go back later and take more, but they had torn it down before I had the chance. I hope these are somewhat close to what you were looking for. I am glad that I had the privilege to get these shots. As you can see, they were taken in winter. I've cherished these photos all these years and I am happy to share them with you. Looking forward to seeing them on your site. I only wish I had taken more." *Jerry Butler - Famed Rythym & Blues singer and song writer Jerry Butler is said to have graduated from Cooley High School. Read more about a Jerry's accomplishments at http://en.wikipedia.org/wiki/Jerry_Butler_(singer) .